2014 Raku Day - Valley Potters Inc. Waiting for the kiln to get to temp. 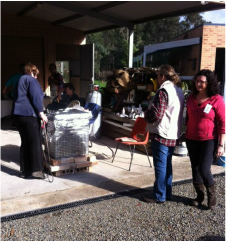 What fantastic weather we had on the Raku day up at Laura’s on the 21st of June! I’d been keeping an eye on the weather for a week hoping that it would fine up. I’d dressed in so many layers that I found it hard to move freely. It was nice to peel them off as the day went on and it warmed up. We had a great bunch of 15 participants for the day and the results were fantastic. There are some amazing, creative people in our midst. It was a very special ”0” birthday day for Ruth, one of our long standing members and Linda, Ruth’s niece, made a delicious owl cake (carrot cake) to celebrate which we all enjoyed for morning tea. 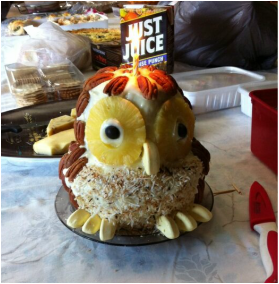 (No owls were harmed in the making of this cake). We were kept really busy glazing, drying pots, eating, firing, eating, and putting paper into the bins. We did run out of newspaper so we scrounged through Laura’s bins to get the day finished off with all the work getting through. As usual the Valley Potters put on a huge array of delicious food, Laura made a lovely pea and ham soup. Flynn, the resident chocolate Lab even enjoyed an orange cake while everyone was out with the pots. The piece that I love the most was the Chameleon made by Rose, one of the visitors to the Raku day, the lustre was beautiful and rather striking while sitting in the sun. I'm just really sorry I didn't get a photo of it, hopefully someone will have one and I'll put it on. A huge thank you to Laura and Pete Windmill for all they did to make the day a great workshop and for hosting it again this year. 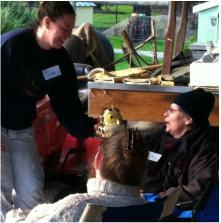 Thanks to Olga, our Workshop Officer and to all of the potters who came to join in the fun. Keep hoping for good weather next year.